With patterns divided into two sections by top-down and toe-up construction, Sock Knitting Master Class explores techniques, such as cables, twisted stitches, lace, stranded colorwork, entrelac, shadow knitting, and intarsia worked in the round. You’ll discover inventive ways to start and end socks, shape heels and toes, and knit soles. With Sock Knitting Master Class, you’ll be knitting like the pros in no time! Sock Knitting Master Class is an all-star assembly of the most inventive and exciting designers working with socks today, including Cookie A, Kathryn Alexander, Nancy Bush, Cat Bordhi, Priscilla Gibson-Roberts, Anne Hanson, Melissa Morgan-Oakes, Meg Swansen, Anna Zilboorg, and many more! As a bonus, you will also learn how each yarn contributes to the overall design from Clara Parkes. 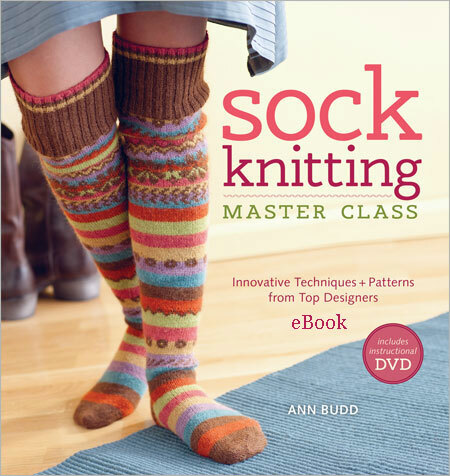 From best-selling author, Ann Budd, Sock Knitting Master Class offers a one of a kind opportunity for knitters to learn from the best and brightest in the knitting world, while sporting the latest and greatest in sock fashions. On a bonus enclosed DVD, Ann showcases all you need to know to knit fun, inventive socks, including a few special tricks and tips from this master sock knitter. You’ll find the DVD a great companion to learning both top-down and toe-up techniques.